WHAT IS THAT SHINING OBJECT? Pissarro’s paintings often leave us with unanswered questions; that’s part of the allure of his artistry. We might not notice the shining arch on the left over the bridge if the sail of the red boat did not point to it. In reality, it is not what it seems or what we might imagine. The right lower quadrant of this painting is filled with heavy objects–buildings and barges. The rest of the painting is dominated by the lightness of sky and water. Yet the painting feels perfectly balanced. That’s the genius of Pissarro. We are standing on the quai, along with two men at the canvas’s right edge. Our eyes follow the sweeping curve of the riverside to the buildings and back across the bridge. Just before we reach the other side, this shining thing appears. It’s not part of the clouds—its white is completely different from the darker clouds behind it. It looks like an apparition, but we know of Pissarro’s distaste for symbolism. The truth became clear in 2010 at the superb exhibition, A City for Impressionism: Monet, Pissarro and Gauguin, at the Musée des Beaux-Arts in Rouen that included this painting. 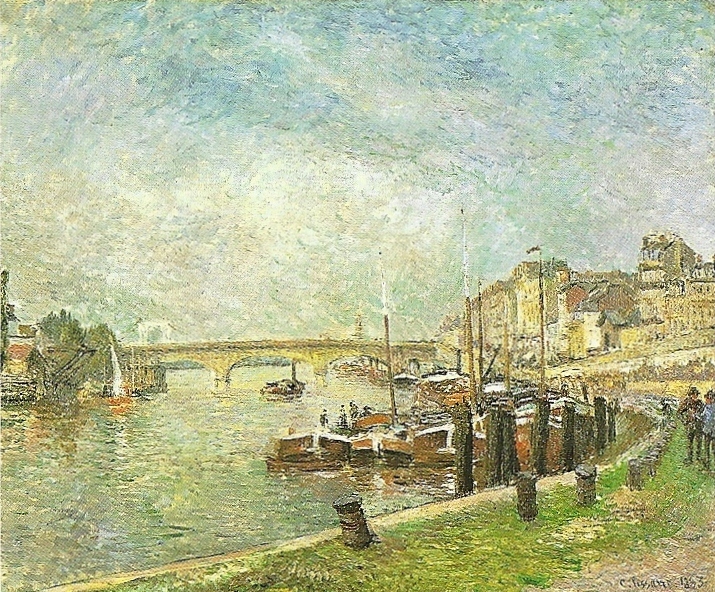 The bridge Pissarro painted is Pont Corneille, which connected Rouen with Saint-Sever, the town across the river. At that time, there was a suspension bridge upriver from Pont Corneille. Built in 1836, it was called the “wire bridge” because of the fragile appearance of its cables. While the bridge itself was not visible from Pissarro’s location, the shiny arch that supported the bridge’s cables rose above the level of Pont Corneille. In this case, Pissarro was painting exactly what he saw. The historic photograph below shows the “wire bridge” with its arch. Pissarro made three more paintings from that location during this visit, but the shining arch is barely noticeable. Did he feel it was a distraction? He probably continued to paint what he saw. However, the skies in the other paintings are filled with clouds, allowing for little reflection on the shining object. The shining arch disappeared before Pissarro’s next painting excursion to Rouen thirteen years later. The old suspension bridge was replaced by a new iron bridge, Pont Boieldieu in 1888. Pissarro painted the new Pont Boieldieu as many as 16 times during his next three visits to Rouen. It stood until June 1940, when it was destroyed by the French Army to slow the advance of German troops. 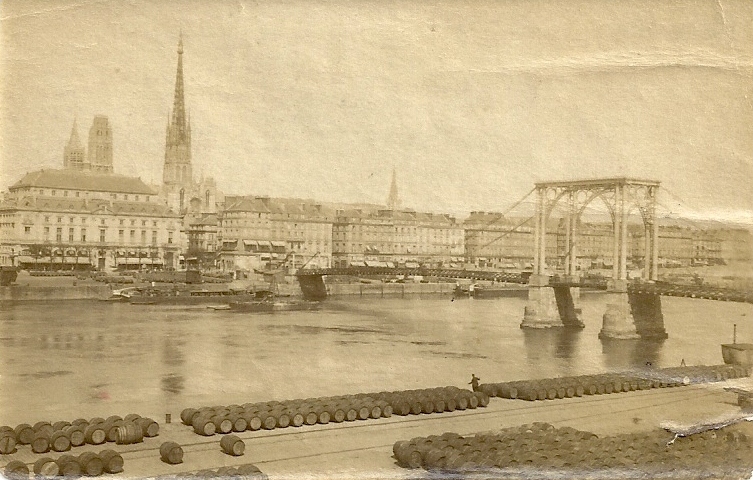 The current Pont Boieldieu was finally opened in 1955. In just 22 days, the blog about Camille Pissarro has grown from 300 views to 406! Readers now represent 25 countries (up from 19 countries) and five continents! Many thanks to all of you from artbookannex.com. 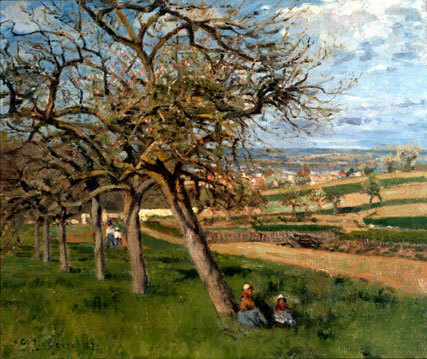 Camille Pissarro had lived in Louveciennes only a year when he made this lovely painting, Apple Trees in Bloom. He had painted the scenes of his neighborhood and now was exploring the nearby countryside. After painting outside in deep snow that winter, he must have been delighted to see the blossoming apple trees of spring. This peaceful scene soon became a war zone. By September, the Prussians had defeated Napoleon III at Sedan and their soldiers began to occupy France. Before the troops reached Louveciennes, Pissarro and his companion Julie fled with their two small children to Montfoucault, the home of their dear friend Ludovic Piette in the Mayenne. Later, the young family went to London for the duration of the war. When the Prussians occupied Louveciennes they commandeered Pissarro’s house, sleeping soldiers upstairs and keeping horses on the ground floor. In the garden, they slaughtered livestock and poultry, using Pissarro’s canvases as aprons and to cover the muddy ground. A great number of Pissarro’s art works were lost or destroyed beyond repair. The catalogue raisonné (Pissarro:Critical Catalogue, 2005) notes that this painting was bought from the artist by Paul Durand-Ruel on April 30, 1872, almost a year after Pissarro returned from London. There is no information on where this painting and other surviving canvases were during the war. This landscape is a complex composition of lines and angles. The road is just one of several layers of colors which come to a point and vanish in a distant cluster of houses. Several apple trees march in a straight row diagonally across the lower left, their precise alignment broken by the leaning tree at the front. In the distance lies a village, perhaps Louveciennes. The apple trees serve as a screen, both concealing and revealing the countryside. Pissarro first used this type of composition the previous year, and he continued to develop his use of this device throughout his career. Apple Trees in Bloom was donated to the McMaster Museum of Art (Hamilton, Ontario, Canada) in the mid-1980s by Dr. Herman Herzog Levy. A beautiful Pissarro exhibition organized for Japanese audiences by the Musée Pissarro in Pontoise. While this exhibition will not be seen in Pontoise, there is an interesting exhibition on view now. “L’arbre dans la peinture de paysage entre 1850 et 1920 de Corot à Matisse.” While in Pontoise, you can see many of the sites Pissarro painted. The Musée Pissarro in Pontoise is just a short train ride (RER) north of Paris.